oomph. : OMG Nail Polish Strips review + a bold lip. a bold lip speaks volumes. as does a great manicure. love on my shirt, and hearts on my nails. what kind of valentine's vibes are you giving off this week? 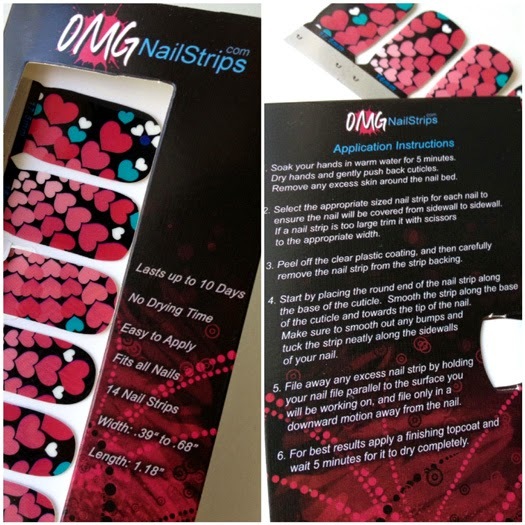 if you're like me and don't have a good chunk of time to sit and do your nails...then wait for them to dry, you'll love these nail polish strips from OMGNailStrips.com. 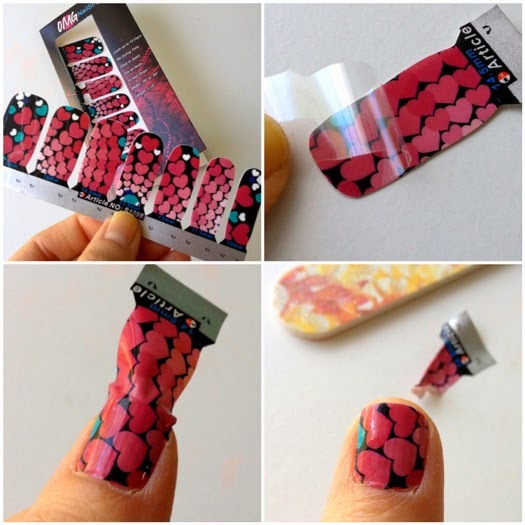 nail polish strips [are different from nail wraps and stickers in that they] are actually made with nail polish but without the drying time. they are thin and stretchy making them easy to mold to your nails. no heat is needed. the strips feel like nail polish on your nails (slightly tacky like almost-dry polish, but it IS dry...weirdly cool! ), and it is recommended that you apply a topcoat. pros: only $7.99/set of 14, fast and easy to apply, no heat needed. if you have short nails, you can cut the strips in half and get two nails out of each sticker - doubling its value. cons: other than wishing they had more designs, i don't have any cons specific to OMG Nail Polish Strips. like any other nail stickers, they needed to be trimmed to fit my tiny nails, and that's what took the most time. if you have short nails and have to trim the stickers, consider the design you choose. you may want to choose smaller and/or repetitive patterns vs a single design that may end up being cut off. have you tried nail polish strips? 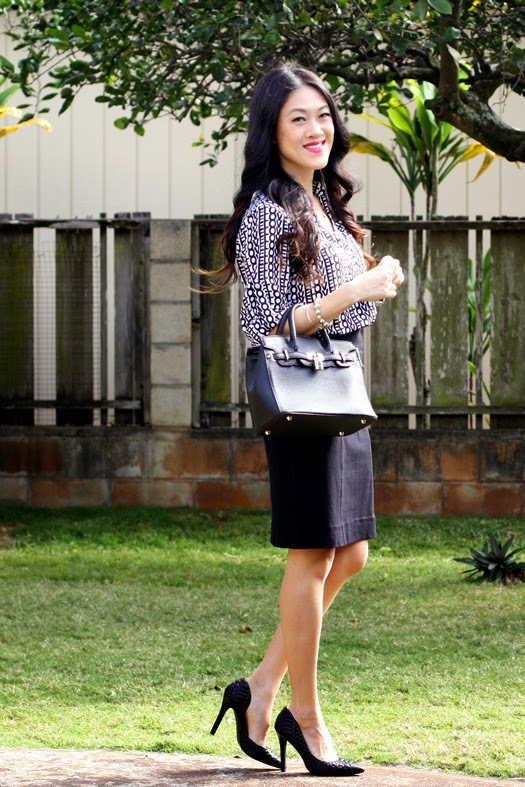 Love red lips and this chic put-together outfit on you. I love your top and your nails. I have not tried any nail polish strips yet. I will definitely give them a try soon. Terrific blouse. Pretty lip-color. I've never tried nail-strips so was interested in your experience. 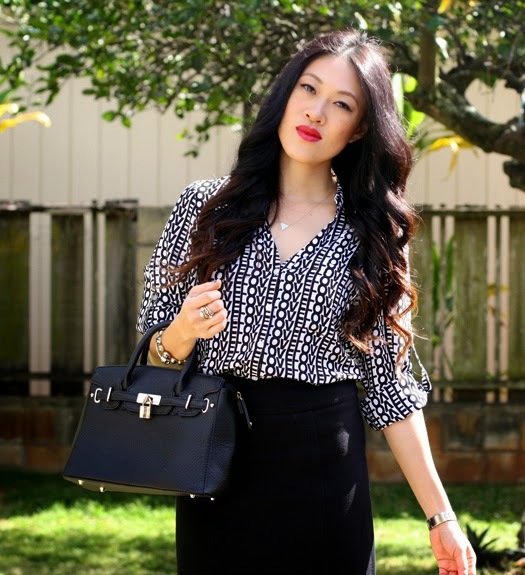 Love the black with the printed top. Those nail strips are so cute! What an adorable top...so perfect for this week! I love those fun nails! I have never tried nail strips, but now I might have to! 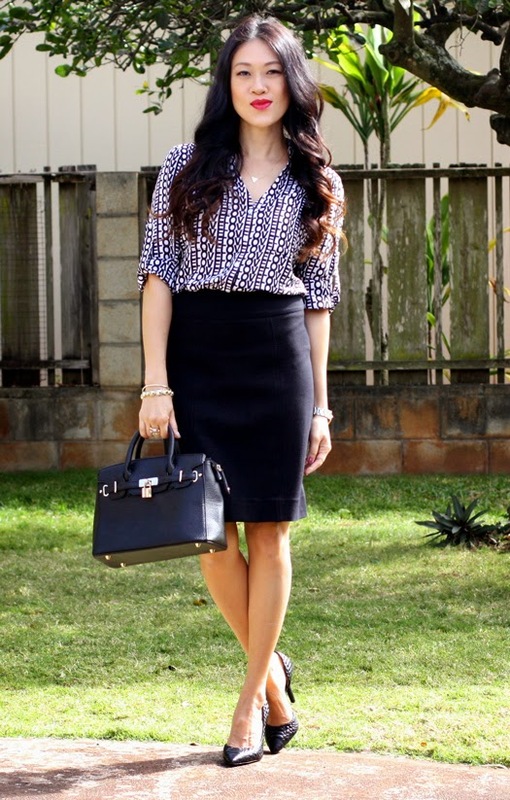 This outfit is chic and classic. And your lip color is so pretty. Very pretty nails! Charming! And bold lips - definitely perfect on you! I've been wanting to try something like this--I am horrible about my nails. Good to know! Thanks for the review! 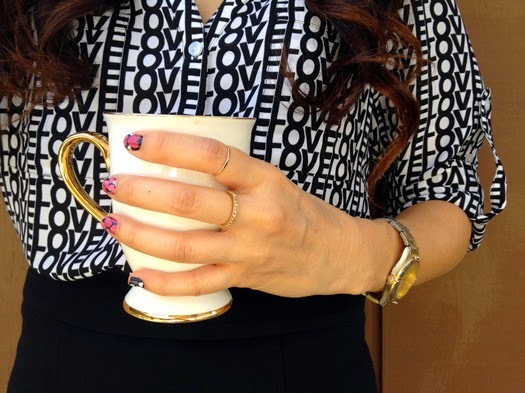 love your pretty valentines-y look and those nail polish strips are so pretty and fun! Cute outfit! I've always believed that you don't have to scream reds or pinks for Valentine's Day! Looking cute as always! I always have a hard time with these nail things, my nails are small so they never come out right. Have a nice week!